After the successful Idol Gives Back show, the American Idol finalists were trimed down to eight. It was a surprise that someone left American Idol during the Idol Gives Back show. The bottom three was Syesha Mercado, Carly Smithson and Michael Johns. The elimination night was squeezed with some scenes from the Idol Gives Back show. I really enjoyed the performance of Jordin Sparks and Chris Brown. Its just that were holding back on their performance. I don’t know if they were tired or unease with each other. The performance is still superb though. Jordin Sparks looked better though on “No Air” video were she was thinner and hot. Jordin Sparks even received a Gold record award from her self-titled album and an award for one million downloads for both singles “Tattoo” and “No Air.” Will she ever surpass Kelly Clarkson and the biggest American Idol winner, Carrie Underwood? 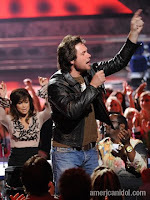 Back to the elimination night, Michael Johns bid goodbye to American Idol. I’d rather chose Syesha to go. What can we expect on the Top 8 performance night next week? According to the American Idol website, we can look forward for love songs. Mariah Carey will be mentor for next week. America, shame on you! Look at what you've done. It's a talent show not a Candy mag survey!